ATHENS, Greece, March 28, 2019 /PRNewswire/ -- Sotheby's International Realty Affiliates LLC announced the highest annual return in history in 2018, with its partners reaching a total sales volume exceeding over 112 billion dollars. Greece Sotheby's experienced one of the highest growth rates worldwide, greatly consolidating its leading position in the local market. "Having completed a year which was characterised by tough and targeted work, we are pleased to announce that Greece Sotheby's International Realty tripled its sales volume in 2018 compared to the previous year, effectively reinforcing its leading position in the luxury real estate market in Greece. Within just 24 months of operation, we have achieved the highest recorded sales by a company in Paxos, Naxos and Ios, while over the past 6 months we have completed the highest volume of residential agreements in Mykonos. At the same time, we have also seen a significant increase in Rhodes and Corfu as a result of the international marketing strategy we have pursued. The outstanding results, both locally and globally, are sound confirmation of a business culture which recognizes that the clients' interests are our most valuable asset. By capitalizing on the strength of our name, building a strong talent pool, working with experienced professionals, and continuing to choose the best property in the country, we are heading towards an exciting and ambitious 2019." Sotheby's International Realty continued to grow in major European markets during the financial year 2018, such as Spain, Germany, Austria, Slovakia and Switzerland. At the same time, 2018 saw the sale of its rights in Cyprus. In Asia, new offices were inaugurated in Sri Lanka and Thailand, while expansion agreements were signed in Indonesia, Vietnam and the Maldives. "Experts predicted that 2018 would be a year in which the global real estate market would move sluggishly," said Philip White, Sotheby's International Realty Affiliates LLC's Chairman and Chief Executive Officer. "Despite all of the forecasts, our highly trained companies and affiliate vendors have continued to make the most of their potential, achieving a truly remarkable annual increase in sales. We plan to continue with the same fortitude in 2019 and reinforce Sotheby's International Realty's network by offering innovative products, tools and research that will enable a top-level service in our sector. " 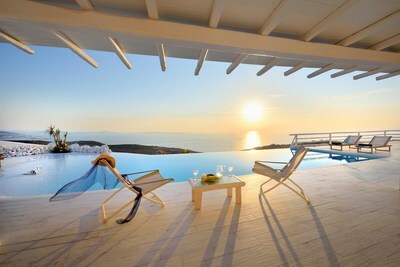 Greece Sotheby's International Realty is the leading luxury real estate agency specializing in the promotion and sale of luxury homes on the Greek islands, as well as in selected locations on the mainland. It is an international award-winning company, with executives who have more than two decades of successful sales experience between them. Using sophisticated promotional tools and taking advantage of the strength of the international brand, Greece Sotheby's International Realty offers excellent residences to outstanding people all over the world.